Passionflower is a plant. The above ground parts are used to make medicine. Passionflower is also used for seizures, hysteria, asthma, symptoms of menopause, attention deficit-hyperactivity disorder (ADHD), nervousness and excitability, palpitations, irregular heartbeat, high blood pressure, fibromyalgia, and pain relief. Some people apply passionflower to the skin for hemorrhoids, burns, and pain and swelling (inflammation). In foods and beverages, passionflower extract is used as a flavoring. In 1569, Spanish explorers discovered passionflower in Peru. They believed the flowers symbolized Christ’s passion and indicated his approval for their exploration. 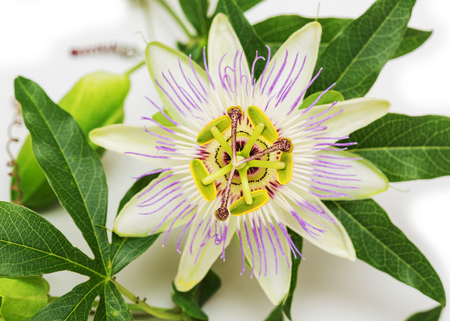 Passionflower is found in combination herbal products used as a sedative for promoting calmness and relaxation. Other herbs contained in these products include German chamomile, hops, kava, skullcap, and valerian. Passionflower was formerly approved as an over-the-counter sedative and sleep aid in the U.S., but it was taken off the market in 1978 because safety and effectiveness had not been proven. However, passionflower may still be available alone or in combination with other herbal products.